I'm a big granola eater if you didn't already know. I eat it with yogurt, on top of my smoothies, with my oatmeal and by the handful. Sister Kathleen got the whole family hooked on homemade granola. I couldn't tell you the last time I had or bought store-bought granola. She made the yummiest sweet potato granola for a travel treat last weekend that it's times like this I wish she still had her blog so she could post the recipe, maybe a guest post is in order! I had already finished off my batch at home and was in need of some more to get me through the week. 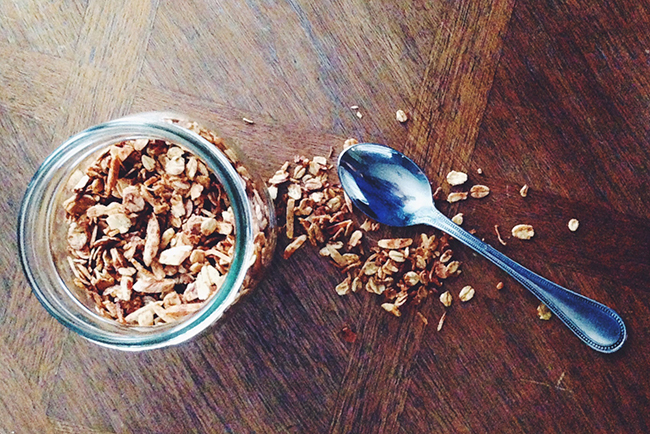 I compiled a few recipes to create this honey almond granola made with coconut oil. It's super crunchy and not too sweet, just perfect if you ask me. Preheat your oven to 300 degrees. In a large bowl combine oats, almonds, coconut, salt and cinnamon. In a small microwave safe bowl, melt the honey and coconut oil for 40 seconds. Stir the extracts into the melted coconut oil mixture. (If using olive oil still melt the honey to make it easier to mix in). Pour the honey mixture over the oats until it is all coated evenly. Spread out on a parchment lined baking sheet and bake in two-20 minute increments, stirring halfway through for a total of 40 minutes. Before eating at Jack's Wife Freda in New York I scoured their Instagram and Yelp page to help decide what I wanted to order (I do this with every new restaurant I eat at). Their food is so colorful and pretty it didn't really help narrow it down. I wanted something a little more hearty, but my eyes were struck by their pretty bowl of yogurt with grapefruit and granola. I passed it as my order but made note to recreate at home! I'm on a huge grapefruit kick right now. Bright citrus mixed with creamy yogurt and my crunchy honey almond granola makes for the perfect start to your a.m.